Are Double Terminated Quartz Similar In Energy To Herkimer Diamonds? Dear wonderful people of HC, I have a question for you. I am very new a crystals, so I have a LOT to learn. Just a few weeks ago I came across a gorgeous crystal grid that I would like to duplicate. It includes Herkimer diamonds. In my boundless excitement over this grid, I ordered some double terminated Quartz points from Pakistan, but realized just yesterday that these are actually not "true" Herkimers. So are these Quartz points something completely different? Do they have completely different properties than the Herkimers or could I still go ahead and use my Quartz points instead of the Herkimers in my grid? Thank you so much for your help and crystal blessings to you all. Herkimer Diamonds are crystals that can only be found in Herkimer County in New York. They are naturally double terminated and actually come from the ground that way - which is one of the things that makes them special. 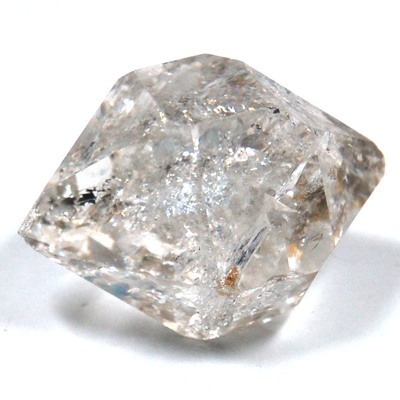 You will find crystals that have a "Herkimer" shape but the only way that they can be a true Herkimer Diamond is if they come from Herkimer, NY. While every, individual crystal contains it's own personal energy Herkimer Diamonds and Double Terminated Crystals do carry much of the same energy. It is the double terminated state of the crystal that allows the energy to flow in and out and make this such a powerful crystal for attunements and grids. Personally, I believe that the double terminated crystals that you have ordered will be perfect for you. However if you do wish to return them or exchange them just let our Customer Service department know and they will be happy to help you. Something else to consider is that you got the Double Terminated crystals for a reason. Perhaps they chose you? You don't want to be so focused on creating something specific that you close yourself off to other possibilities. It is a mistake that we all make. Always trust your intuition and let the crystals speak to you - that is when you get the best energy from them. Thank you again for your question and for your support of Healing Crystals.com. We so appreciate that you are our customer and I hope that this information is helpful. Please let me know if you have any other questions. I will look forward to hearing from you again soon! Wishing you lots of Love and Light - and good luck with your grid!